Hair straightening products have always been in demand and have proved to be a huge boon for those who love flat, sleek, and pin-straight hair. 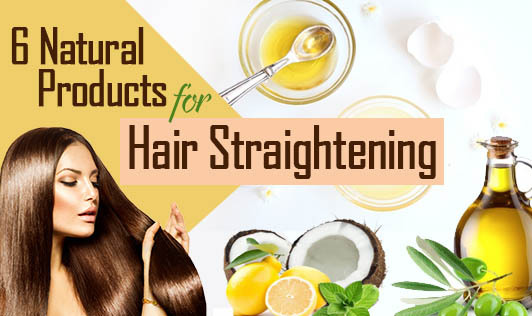 However, the chemicals that make your hair sleek also excessively damage your hair and therefore, natural hair-straightening products are something everyone should look out for. There are many such natural products present in the kitchen and regular use of these will help make your hair smoother, softer, and straighter over time. Here is a look at a few of those products that can be used to straighten hair. Coconut milk has good hair-straightening properties, and if you add lemon juice to it, it gives better results. Grate the coconut and extract milk from it, add lemon juice, and refrigerate for a few hours. A creamy layer will be formed on top of the mixture. Apply the creamy mixture on your hair and wrap it with a hot towel, wait for an hour, and wash it with a mild shampoo. Once your hair dries, you will notice that you're unruly, curly hair has instantly been transformed to soft and manageable. Not many people know that apart from nutrition, regular hot oil treatment can also make hair straight and smooth. Mix equal amounts of coconut and olive oil. Massage this mixture onto your scalp and hair and cover it with a hot towel for around 45 minutes. Wash your hair with a mild shampoo. You can also use almond oil instead of olive oil. Make your curly hair soft and silky by regularly using tea liquor, a natural hair conditioner. Mix tea liquor- made with 1 tsp liquor, 2 tbsp honey, and juice of 2 lemons, and apply on wet hair. Keep it on for 2 to 3 minutes and wash off thoroughly until the stickiness disappears. Milk is very useful hair-straightening product. Just pour some milk into a spray bottle and spritz it all over your hair. Wait for 30 minutes and then wash with a mild shampoo for instant soft and smooth hair. Mix milk and honey to make a paste, add a mashed banana or a few strawberries to it to make it more effective. Apply the mixture onto your hair, wait for around 2 hours, and then wash it off. Olive oil & egg can do wonders to your hair. Beat 2 eggs in a bowl, add enough olive oil, mix, and apply on your hair. Wait for an hour and wash it off with a mild shampoo.